Saffron Coach House01799 526595work Self-cateringSelf-catering at the 3 bedroom, 3 bathroom Saffron Coach House is available from 1 night at £175 per night to a discounted price as above for a one week stay, both are plus a £25 exit cleaning fee. It is a self-contained house (rated as a Silver award 4 Star Guest Accommodation) which is perfectly located for visiting family in the area, a weekend break, wedding accommodation, a leisurely short holiday, business or re-location. Its proximity to Stansted Airport, London, Cambridge, Duxford make it a favourite family place to stay! The House sleeps 6 people (plus a small child) has 3 bedrooms, 2 of which are double en-suite and a ground floor twin room with its own private bathroom. One of the double rooms can also be converted to a twin room and a travel cot and high low chairs can also be provided. Bedrooms are of the highest standard and all individually furnished along with flat screen televisions, hairdryers, iron and board, free cable Wi-Fi throughout the house and all linen and towels are provided with a mid-stay service for longer visits. Two en-suite bedrooms and the ground floor twin has its own private bathroom. It also offers a spacious comfortable lounge/diner with a large flat screen television, a very well-equipped kitchen and a pretty private patio with table and chairs (washing line too) together with private parking for several cars - all within a few minutes’ walk of the town centre. Saffron Hall, Saffron Screen Cinema, Audley End House and Parklands Wedding venue are also close by. 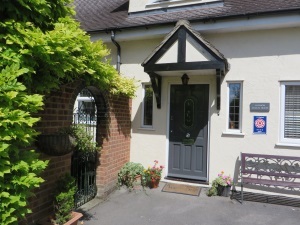 A minimum of one day stay to longer is available - please check our website www.saffroncoachhouse.com for testimonials or telephone Valerie on 01799 526595 for more information. We have many satisfied returning guests and hopefully look forward to welcoming you in the near future! Self-catering at the 3 bedroom, 3 bathroom Saffron Coach House is available from 1 night at £175 per night to a discounted price as above for a one week stay, both are plus a £25 exit cleaning fee. It is a self-contained house (rated as a Silver award 4 Star Guest Accommodation) which is perfectly located for visiting family in the area, a weekend break, wedding accommodation, a leisurely short holiday, business or re-location. Its proximity to Stansted Airport, London, Cambridge, Duxford make it a favourite family place to stay!